Occasionally in the snack food critics life something confusing happens where you can't remember reviewing something, rediscover it, and then find your original review and agree with yourself. In the case of the Bahlsen Pick Up! Bars the reverse is true. I often mentally write the review while eating, sometimes make a few notes, take the pictures and then write it all up later. In the case of these I foolishly didn't take the picture. This caused me to think that I'd already written about them and to carry on as usual. While eating one of the last ones in the pack I had the sudden realisation of what had occurred. Pictures were hastily taken so that it could be added to the review stack. Chocolate lovers buy chocolate bars. Biscuit lovers tend to just buy a packet of biscuits. It's a bit odd when you are out, to walk around town eating from a packet of biscuits - you get funny looks. Especially when it's a big pack like the savers or values range and you aren't sharing them with anyone. To this end the biscuit bar was invented. Biscuit lovers know which these are and seek them out - basically it's anything with a higher biscuit ratio than a Twix. The most popular example was Penguin in the UK, which seems to have gone out of fashion these days, which is just a Bourbon biscuit coated in milk chocolate. This Bahlsen Pick Up! 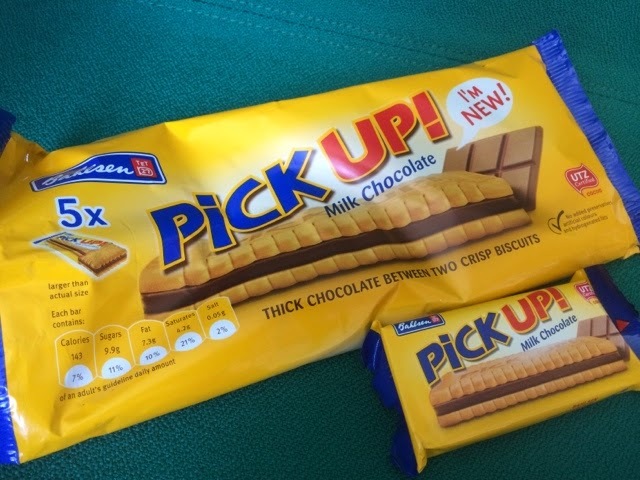 Is essentially two of the Bahlsen regular biscuits with a thick, hard slab of chocolate down the centre to add variety and legitimacy to the experience, and to trick chocolate lovers into buying it. The creamy rich flavours of the biscuit are very familiar to anyone who has eaten from this range and do not dissapoint. The only problem is that when you are used to eating a stack of the choco Leibniz biscuits that one bar isn't quite satisfying enough. I've kept these stashed at work for emergency use only (which is why there were some left a good few weeks after we got them) but I'd say these would be perfect for sneaking into break rooms and for giving to relatives who have visited with their cup of tea - just like Penguin in the 90s. With the right advertising these could become a staple tea time snack, but I fear that the health conscious kick may have put these just out of the reach of such P-P-P-Imortality stakes. Will buy again, and probably keep in rucksack for trips as these are pretty hardy and a good way to eat a few dozen biscuits without getting the look in public.